In the beginning of the year Samsung renewed its Q-series and announced Samsung Q300, now it is launching on the market. The differences from the other models are not considerable: polyphony and the new colour of the internal display backlighting. GPRS (4+1), IR-port are stayed from the previous models. The phone has a transitional position in the line, more advanced models will be launched after it. But let's turn to Q300 first. As always the colour of the phone is silver, the dimensions are 85x48x23 mm and the weight is 89g. The phone is handy, it is easy to open it with a help of one hand. An external antenna is rather long and it is not convenient to wear the phone in the pocket of jeans, it's better to wear it in case or patch pockets. 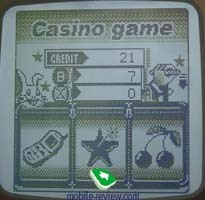 You can find an external display on the front cover of the phone, it is holographic and shimmer by green without backlighting. The backlighting itself is blue. 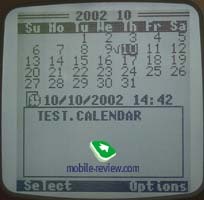 The display has a resolution of 96x64 pixels, what allows to show up to 3 lines of information. 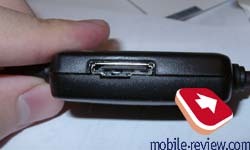 A double volume key is placed on the left-hand side of the phone, lower - is IR-port. A portable handsfree connector is positioned on the upper side and system connector is on the bottom. It is covered with a rubber cap, which doesn't fasten to the phone, to prevent the connector from dust. Very often one forgets to cover the connector after the re-charging. When you open the phone, you see a display, which has a white backlighting and it looks very unusual. I don't remember any model with such screen, it is the first one. 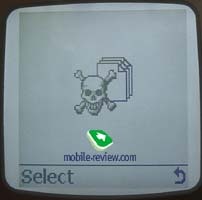 The internal display has a resolution of 128x128 pixels and can show up to 5 text lines, one line with icons and tips to the soft-keys. A 4-directionlal navigation key is positioned on the lower part phone, a key, which provides access to WAP-browser, is included in the center of this key. Plastic keys are well-spaced and comfortable to type. At last, some words about the battery. Engineers decided to increase the autonomy of the phone and equipped the model with a lithium-ion battery of 900 mAh capacity. According to the manufacturer it can provide up to 175 hours of standby time and up to 3.5 hours of talk time. In reality the phone worked about 3 days (MTS network) in case of 30-40 minutes of talking and minimal using of other applications. The time of full recharging is about 2 hours. The menu structure is traditional in this model, there is shortcut number navigation here as well. 4 shortcuts (the most frequently used features) can be set to the navigation key. Let's turn to the features of the phone. Phonebook. 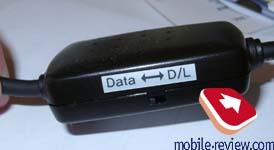 Up to 100 phone numbers can be stored in the phone memory, and only one number can be associated to one name. There are caller groups here and each one can be associated to its own icon, ringing tone or SMS message. The list contains both numbers from the phone memory and numbers from SIM-card memory, a quick search and search by name is available. 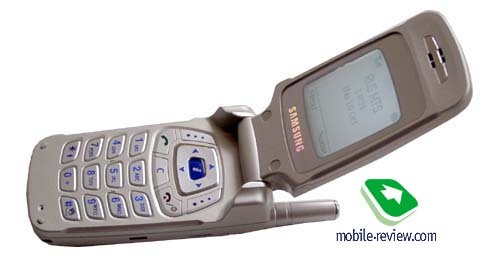 The capabilities of this phonebook are scarce if compare them to the other phones from Samsung: limited memory space and no voice dial. Messages. The phone supports EMS-messages (version 4), there is a set of sounds and graphics, especially for them. You can keep up to 50 messages in the phone memory. Furthermore, a user can create up to 5 own templates. Supporting of EMS-standard allows to format messages (alignment, changing of font size and font type). The concatenated messages (up to 918 characters) are also available. Call records. 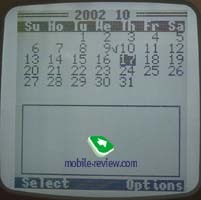 Three call lists are placed in this menu. Each of them contains 10 phone numbers (received, missed and dialed) with time and date indication. You can also view a call duration and cost here. Sound settings. The user selects a ringing tone (up to 20) here, all the melodies are polyphonic. The phone supports 16-tones polyphony, the volume of the melodies is high, but when it is maximal a loudspeaker begins to distort the sound. It's not heard in noisy atmosphere but noticeable in quite places. You can also set a minute minder, which will beep before the end of every minute of talking. Phone settings. 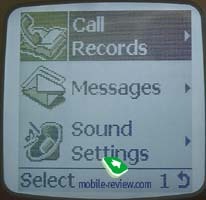 All settings connected with the phone and its capabilities are collected here, the IR-port is activated in this menu too. Organizer. An organizer has a monthly view and all events of the viewing day are displayed lower, what is very convenient. The days with events are indicated by ticks, there is a quick access to the desired day. The organizer is rather ascetic, events are not divided in different categories. You just input the note, set a signal and that's it. If you like you can use a to-do list, which has two levels of priority (high and low), but doesn't have reminders. Two alarm-clocks (recurrent and usual) cam be set here too. You can also select an autopower feature and the phone automatically turns on when an alarm-clock works. 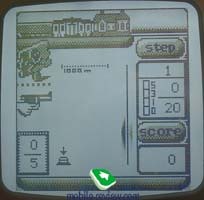 A world time feature and calculator are also placed in this menu. Funbox. You get access to Wap-browser in version 1.2.1 and to the folders with downloaded ringing tones and pictures from this menu. 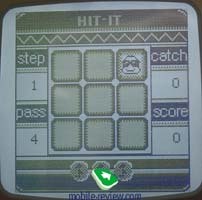 Seven games are hidden here too, nothing new, we've already seen them in other phones, for example in A100. They are the following: Casino, Roulette, Black Jack, Sniper, Snake, Mole, Othello. In spite of the quantity the games are not very interesting and not captivate. A cable for synchronization with PC (RS232) and CD with software (GPRS Wizard and Easy GPRS) is included in the standard kit. A cable has a charging connector, you can work and charge the phone simultaneously. 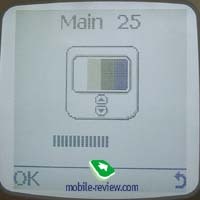 The first application is necessary to enter the Net using GPRS, there is a special switch on the cable for data mode (turn it to the position data while synchronization). The second application is more interesting, it enables to edit phonebook, short messages from PC, compose melodies and download them to the phone. 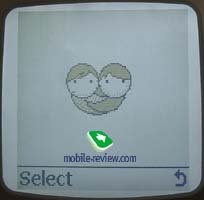 You can also download your own images, there are many pre-loaded ringing tones and images on CD. The phone differs from the other phones from Samsung by the sufficient autonomy, nice and laudable polyphony. 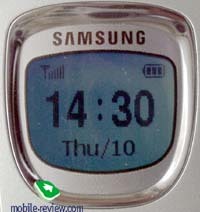 Namely the ring of this phone attracts the public attention greatly (in public places), what didn't occur with other phones. The vibrating alert is average. 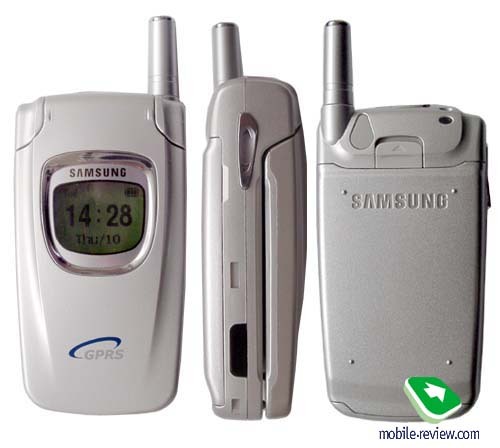 If to say about the sound quality, this phone doesn't have any problems, it is typical for folder types phones from Samsung. Here you could listen ringer tones (mp3, 1Mb). In our opinion Samsung Q300 is a transitional model, the features are scarce and there is lack of rather common functions here, though to say the truth the available features are perfectly realized. The expected price is 250$, it is not very expensive phone.